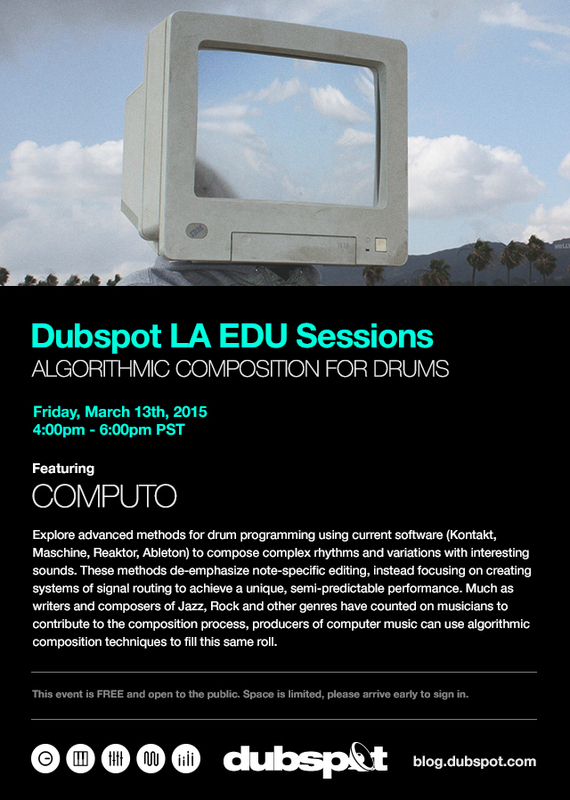 On March 13th, our LA EDU Sessions continue with a free workshop hosted by Dubspot Instructor Computo exploring advanced methods for drum programming to compose complex rhythms and variations with interesting sounds. This workshop will explore advanced methods for drum programming using current software (Kontakt, Maschine, Reaktor, Ableton) to compose complex rhythms and variations with interesting sounds. These methods de-emphasize note-specific editing, instead focusing on creating systems of signal routing to achieve a unique, semi-predictable performance. Much as writers and composers of Jazz, Rock, and other genres have counted on musicians to contribute to the composition process; producers of computer music can use algorithmic composition techniques to fill this same roll. Joe Caputo aka Computo attended Carnegie Mellon University and graduated from the Berklee College of Music before moving out to Los Angeles in 2005. Prior to joining Dubspot, he worked for Native Instruments for five years as a trainer and software guru, teaching VIP artists like A-Trak, Flying Lotus, Duran Duran, Maroon 5, Zedd, and Borgore. Joe is one of the main teachers in the online version of our Sound Design program, and he is a master of helping students learn how to create the sounds of today’s music. He produces music himself in many genres, but really loves creating weird sounds for their own sake.